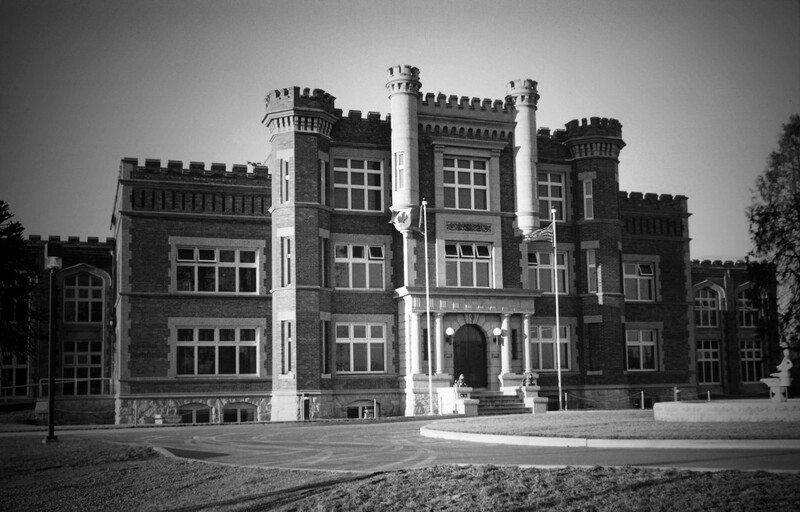 The complex of buildings now known as the Vancouver Island Regional Correctional Centre, the Wilkinson Jail, or “the Wilkie” has had a rich and storied life, which may explain why so many spirits and ghosts still wander the halls. In researching this building, I not only had the opportunity to talk to a couple of correctional officers, I also had a chance to tour the facility and get my own impressions of this rather foreboding institution. It started as the Saanich Prison Farm. It was built in 1914 to welcome thirty-eight prisoners from the old jail, which itself had been built to replace the original jail in Bastion Square in downtown Victoria. The second jail had been partially destroyed by fire in 1912. Rather than rebuild it, the government decided to build a new twenty-five-acre prison farm. The prison was built for the princely sum of 100,000 dollars, 2.4 million dollars today. It was designed by William Ridgway Wilson, the same gentleman who designed the Bay Street Armoury. It was built to house up to 140 prisoners, with room to bring in forty additional beds. There were also outbuildings and barns built by the prisoners, but these were removed in 1985 when the prison was modernized. Surprisingly, the Saanich Prison Farm was only in operation for three years. It closed in 1917 to save money—and to send prisoners to fight in the First World War. The Colquitz Mental Home was located in the building from 1919 to 1964. The hospital was home to a wide range of criminally and dangerously insane men. These men worked the farm grounds that were then still part of the facility; as it turns out, they were great farmers. In the 1930s, the patients produced 90,000 pounds of vegetables, 4,000 pounds of fruit, and 15,000 pounds of meat. It wasn’t all fun and games though. During the 1920s, there were numerous escapes. While the site was being used as a mental hospital and farm, several additional buildings were constructed on the property, along with other attractions such as fishponds, greenhouses, barns, stables, and even a tennis court. These were all built by the patients. During this time, there were also several deaths as many of the patients weren’t so much insane as they were hard to care for. Institutionalizing people was done as a matter of course in those days. These patients were often not in great health to begin with, but you have to wonder if being locked up with people who were certifiably or criminally insane shortened their lifespans further. After almost forty-five years as a mental home, the building reverted to its original purpose and became the Oakalla Prison Farm in 1966. Within a few years it was renamed the Vancouver Island Regional Correctional Centre, which is still its official name, but it is commonly known as the Wilkie. One of the correctional officers had an experience a few years ago. He was sitting in one of the units, which have kitchens and seating areas with cells off to the side. He was right in the middle of the castle façade. The windows in the façade were all closed. The officer was doing some paperwork when he heard what he thought was the wind picking up, but he didn’t think much of it. After that he heard a clunk, looked up, and saw the coffee pot fly off the counter. It travelled nine or ten feet, and then hit the wall. It hit the wall with such force that the handle broke and the metal pot was dented from the impact. Needless to say, the officer didn’t spend a whole lot of time up there alone anymore. Another officer spoke of something that happened in another original site unit. He was there alone when he heard a deep rhythmic thumping noise coming from a wing that was under renovation and therefore empty. It started out quite faint, but became more noticeable. As he lingered alone in the unit doing his checks, the noise got louder and louder. He finished his checks, which he did thoroughly, but admittedly in a hurry, and got out of there as quick as he could. So far he has not needed to go back. There are many other stories of noises, particularly the sound of doors closing, which is odd as all the doors are locked as standard procedure. People often hear voices, footsteps, and other inexplicable sounds. These stories are not limited to the officers either. A former guest of the jail shared a story about being in his cell. One night he was woken by what he thought was his cellmate trying to get in his upper bunk with him. He could feel something cold and solid all the way up his back and felt the blankets being tugged. The inmate jumped off the bunk only to see his cellmate in his own bed, wrapped in his blanket, facing the wall, and sleeping deeply. The poor man was so affected by this experience that he begged the correctional officer to put him in another cell. The officer agreed to; he admitted that he too had experienced strange things, and so had many other officers and inmates. That particular cell was known for being the source of strange laughter, even when it was completely empty. It was always the same slightly mocking laugh, though the inmates changed on a regular basis as this particular section of the jail was for stays no longer than thirty days. When I was in the prison, I was struck by quite a number of different presences that remain within the walls. The impression I got was that they were not from the time when the facility was a prison, but more likely from its time as a mental hospital. The ones who have remained are quite likely not even aware they are dead, and are also likely to cause trouble. I didn’t get the impression that they are malicious, but they are certainly active and enjoy scaring people; officers or inmates—it doesn’t matter to them—although they’re likely to go a little easier on the inmates as they will see them as compatriots. Go past the Wilkie on your next drive around Victoria. What do you feel? Anything of note? This really is a fascinating site and one we are lucky to have been able to keep around for so long.